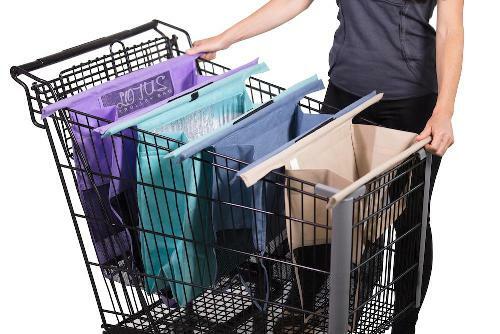 Now that disposable bags are (thankfully) being eliminated in cities across America, you need to grab the Lotus Trolley Bag for all your shopping trips! 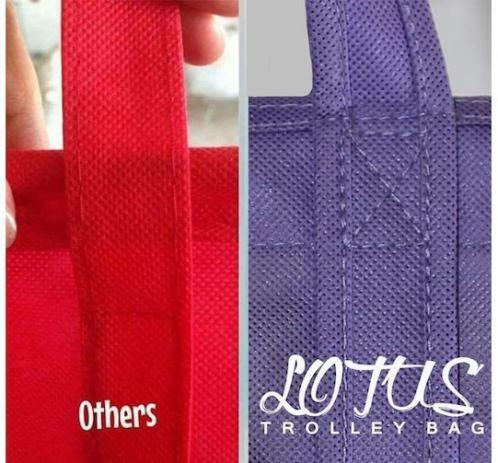 The Lotus Trolley Bag is a reusable 4-bag system that will transform your shopping experience. 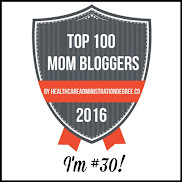 I was delighted to be asked to review them and I'm SO happy with them. 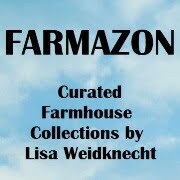 They are ON SALE right now, so grab your set HERE or read on to learn more! The bags spread out accordion style in your shopping cart to allow for easy packing and organization. 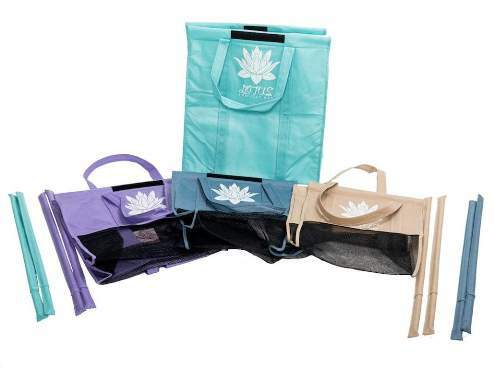 There is a deep insulated bag for cold items, inner pockets to hold eggs securely, inner wine sleeves to keep bottles safe, and strong mesh bottoms to prevent spills from pooling and molding. The poles at the top of each bag sit over the edge of the cart. I use mine throughout the entire store, so I can group items together while I shop, set my grouped items on the counter, then pack them right back into the bags at checkout. Or you can leave the set hanging on your cart until you reach checkout. 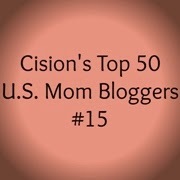 They roll up nice and neat into a clutter-free, lightweight carrier, and are even machine washable. Lotus Trolley Bags save time and energy, while helping to eliminate millions of wasteful, harmful, plastic bags from our environment. They are extremely well-constructed, with extra stitching to ensure your food won't end up on the ground. So many people at the store stop me to find out where I got them! 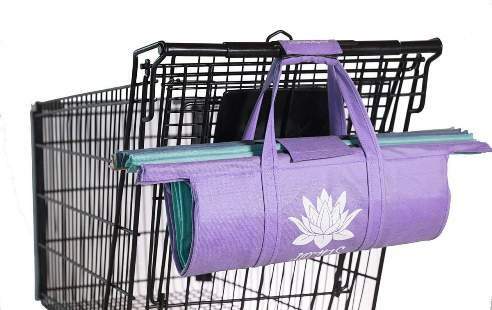 I have tried MANY reusable shopping bags over the years and the Lotus Trolley Bag is my new favorite! I love that the bags are lightweight, so they aren't adding weight to the already heavy groceries that have to be carried. I really love the extra pockets on the inside to protects my eggs and wine, and the cooler bag is perfect for my frozen and refrigerated foods (especially in the summer). The cart-sitting poles can slide out of the bags if you want to leave them in your car while you carry the bags into your house. The way they all roll up together is so ingenious, and the entire set is only about the size of a yoga mat when it's rolled up. 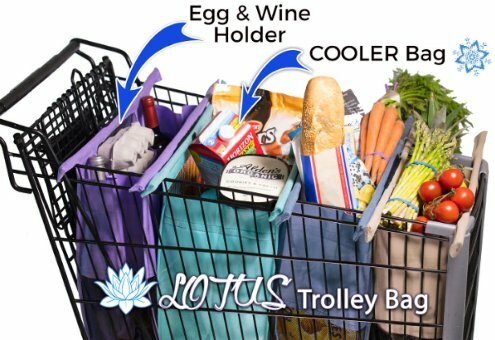 I am absolutely delighted with the Lotus Trolley Bag and think it's the perfect holiday gift for anyone who has to do the drudgery of grocery shopping (which is almost all of us!). 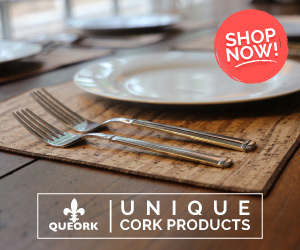 Order today so you don't miss out on this great price! today at this hot sale price!